Luca Castagna, A Bridge across the Ocean: The United States and the Holy See Between the Two World Wars (Washington, D.C.: The Catholic University of America Press, 2014), Pp. xvii + 193, ISBN 978-0-8132-2587-0. C. Gallacher, D. Kertzer and A. Melloni, eds., Pius XI and America (Berlin: LIT Verlag, 2012), Pp. 450, ISBN 978-3-643-90146-9. The Vatican is the world’s oldest diplomatic entity. But in the last two centuries it was confronted with challenges and set-backs which threatened its very survival. In the mid-nineteenth century it was robbed of its long-held territories by the upstart new Kingdom of Italy and reduced to a small sliver of land in the heart of Rome. At the same time Pope Pius IX retreated into a theological obscurantism which led the church in hostility to any modern patterns of thought. The nadir of the Vatican’s diplomatic influence was, quite possibly, the era of the First World War, when a combination of intrigues by the new Italian government and the anti-Catholic obstinacy of the White Anglo-Saxon Protestant President Woodrow Wilson barred the Vatican from the Paris peace conference and the Versailles settlement which resulted. At the same time, the United States saw a resurgence of anti-Catholic nativism and the revival of the Ku Klux Klan, with its vociferous outbursts against Catholics, Jews and blacks. For its part, the Vatican was engrossed with trying to establish a set of legally-binding agreements or concordats with the numerous new states which had arisen in the wake of the war. These were supposed to secure the position of Catholic institutions and personnel, but, as the case of the German Concordat signed in 1933 was to show, the results were mixed. In fact, almost immediately protests were launched with the German Foreign Ministry about breaches of the agreement, but no satisfaction was ever given. The situation in the United States did not improve until the election of Franklin Roosevelt in 1932. His campaign for social reform in the New Deal was widely welcomed by the under-class which included many poor, immigrants and Catholics. The Catholic social work community was particularly impressed, and indeed this move paid off handsomely politically when Roosevelt swept many states into the Democratic fold in 1936. This convergence of ideas in the New Deal and the Catholic Church’s social doctrine, as expressed by the National Catholic Welfare Conference, opened the way for a new relationship of mutual collaboration. This also resulted in an unprecedented participation of Catholics in the national sociopolitical context. In the 1930s, the resurgence of nationalist antagonisms, especially sponsored by the totalitarian powers, was alarming to both Roosevelt and the Vatican. This alignment of views on their common need to preserve the world for peace and to prevent further conflicts brought the two diplomatic entities closer together, as was symbolized by the highly successful visit of the Cardinal Secretary of State, Pacelli, (later Pope Pius XII) to the United States in 1936. He was even invited to have a meal with the President at his summer retreat in Hyde Park, where doubtless the two men discussed the looming dangers of hostilities in international affairs. The principal difficulty in this rapprochement arose from the fact that the United States had no diplomatic representation at the Vatican, since such an arrangement had been abandoned in 1857. Roosevelt was well aware that any attempt to persuade Congress to vote the funds necessary for the resumption of diplomatic relations with the Vatican would likely arouse waves of vehement opposition from the extreme Protestant wing, as well as from Isolationists. It would be seen as part and parcel of his attempt to draw America into the vortex of world conflict, and hence would be strenuously opposed. Roosevelt therefore delayed any decision, which was made even more hazardous by the events in Europe in 1938, with the annexation by the Nazis of Austria, which was initially greeted with acclaim by the leading Austrian Cardinal, for which he was strongly criticized by the Vatican. Isolationists in the United States were joined by some vociferous Catholics, such as the voluble “Radio Priest” Father Charles Coughlin, whose diatribes were undoubtedly followed by many of his followers. On the other hand, the possible outbreak of hostilities in Europe added to Roosevelt’s desire to recruit the aid of the Vatican for the active pursuit of peace. The death of Pope Pius XI in February 1939 and the election of Cardinal Pacelli as the new Pope further held up this process. So it was not until December 1939, after the outbreak of war in Europe, and the conquest of the largely Catholic Poland, that Roosevelt finally turned his long-held desire into reality. He subtly hit on the expedient of not establishing a normal embassy but rather of appointing a Personal Representative of the President, who would have the status but not the title of an Ambassador. His choice fell on the wealthy industrialist Myron Taylor, a Protestant Episcopalian, who arrived in Rome in February 1940, and behaved with impeccable style and astuteness, entirely avoiding any ecclesiastical or theological matters. As such, Roosevelt now had a direct line to the Vatican and readily assented to the vigorous attempts to prevent any escalation of the war’s hostilities, particularly with Italy. Mussolini’s decision in June 1940 to ignore the appeals of Roosevelt and Pius XII and to enter the war with his Nazi partner spelled the failure of these joint efforts to reserve peace and humanity. Castagna’s excellently researched examination of the diplomatic archives of both the Vatican and the United States for this short period of twenty years provides a useful extension of comparative diplomatic history. He adds in various papal documents as well as notes the contributions of scholars of this subject in various languages. It is only unfortunate that the papers of Pope Pius XII are still unavailable, so that the next stage of the relationship between the Holy See and the United States, particularly where their policies diverged from 1940 onwards, remains to be told. (For these next events, see J. S. Conway, “Myron C. Taylor’s Mission to the Vatican 1940-1950,” Church History 44, no. 1 (March 1976): 1-15.) It can only be hoped that Castagna, who teaches at the University of Salerno, will be among those scholars invited to follow up this valuable study with a sequel, which could then demonstrate how, in the aftermath of 1945, this relationship actually became the bridge across the ocean of his title. The present short study must therefore be regarded as a prelude, describing the early stages of the thaw in Vatican-American relations which was only fulfilled when full diplomatic relations were finally established in 1984. 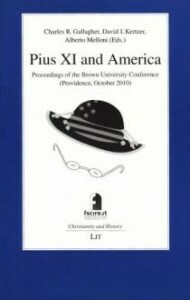 The collected essays in Pius XI and America, contributed by a variety of international scholars for a 2010 conference at Brown University, provide further evidence of the tangential and episodic relationships between the Vatican under Pope Pius XI and the United States in the 1920s and 1930s. It is striking that these scholars limit themselves entirely to the secular realm. There are no papers given on the ecclesiastical, let alone on the theological developments of those years. Instead the articles concentrate on the political and diplomatic aspects of the Vatican’s outreach and how these overlapped with certain American interests. These essays confirm Castagna’s view that relations improved only after Roosevelt’s election in 1932, when the new President believed that the Catholic social and political thought was not far removed from his idealism. So too he came to the conclusion that the Vatican shared his endeavor to maintain peace in Europe and to restrain the vainglorious ambitions of the European dictators. In their various explorations and elaboration of the papers from the Vatican archive, it is hardly surprising that these authors paint a favorable picture of the Vatican diplomats, especially of Cardinal Pacelli. Rob Ventresca, for example, in his survey of Pius XI, Eugenio Pacelli and the Italian Fascism, agrees with Castagna that Pacelli’s moderating influence was designed to head off any open breach with Mussolini’s aggressive tactics over Abyssinia, and to promote a negotiated settlement of the dispute. The price paid was to mute the Church’s public criticism of the morality of Mussolini’s imperial misadventures, which Ventresca suggests set a pattern to be repeated later with the even more serious breaches of the peace by Hitler. In her essay, Emma Fattorini takes a more critical attitude. She repeats the theme of her book Hitler, Mussolini and the Vatican, pointing to the profound differences of position and temperament between Pius XI and Pacelli. Fattorini clearly prefers the irrepressible intransigence of the elderly pontiff. Jacques Kornberg is even more critical, suggesting that both Pius XI and Pius XII failed to conduct themselves according to their own moral standards. The Vatican issued no outraged protests about the Nazis’ November 1938 Crystal Night pogrom because this was seen as not being a threat to Catholic interests. In Kornberg’s view, civic rights, or universal human rights, were not a matter for the papacy’s concern. On the other hand, Fr. Robert Trisco, in recounting the furor over the outspoken criticisms of Hitler and the Nazi regime made by Cardinal Mundelein of Chicago in May 1937, praises Pacelli for castigating privately the malicious invectives and disparagement perpetrated against the Holy See by the Nazi leadership. Trisco also describes the widespread support for Cardinal Mundelein given by different sections of American opinion, including President Roosevelt. Indeed Roosevelt took Mundelein’s advice about the difficult issue of how to restore diplomatic relations between the United States and the Vatican, but otherwise does not feature much in these essays. In all, there are few surprises, since many of the contributors have already had their say elsewhere. But, as Charles Gallacher remarks, there are still unanswered questions, such as why Pius XI sent Pacelli to the United States in 1936, or what topics were covered when Roosevelt and Pacelli met privately at Hyde Park. These essays provide additional details in support of the overview given in Castagna’s book, and as such are a useful and reliable addition to our knowledge of papal diplomacy in the inter-war period.